Image caption John Cryer (second left of panel) said claims of anti-Semitism in Labour were not a "myth"
A senior Labour MP has said he is shocked at some of the anti-Semitic tweets by party members that come before its disciplinary panel. John Cryer said some of what is written "makes your hair stand up", adding: "This stuff is redolent of the 1930s." He was speaking at a fringe debate at the Labour conference in Brighton. Labour says it condemns anti-Semitism in the "strongest possible terms" with "tough new rules" recently agreed by the party's ruling executive committee. These changes to the rule book will be voted on by delegates in Brighton on Tuesday. 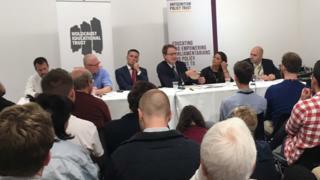 The fringe debate, organised by the Holocaust Educational Trust and the Anti-Semitism Policy Trust, looked at anti-Semitism on the left of politics. Panellists agreed there had been a recent increase in people questioning the Holocaust. Mr Cryer, Labour MP for Leyton and Wanstead, described a "seeping poison" and warned that future generations might not realise that when it came to Nazism, "we were right and they were wrong". As chairman of the Parliamentary Labour Party, he sits on the disputes panel of the National Executive Committee, which rules on what members have "said, written or tweeted", he told the audience. "I have seen some of the tweets from paid up Labour Party members and I am not kidding you, it makes your hair stand up," he said. Some Labour members dismiss reports of anti-Semitism as a myth, he said. "But you don't have to look very far before you see it's not a myth...and there's no place in the Labour Party for stuff like that." Another MP, Wes Streeting, said a "rump" of anti-Semites in Labour should be "driven out" of the party. "It isn't anti-Semitic to criticise the Israeli government," he said. "Unfortunately we see too many people examples of anti-Semitic language being used in order to do so." Karen Pollock, chief executive of the Holocaust Educational Trust, said: "Why do people want to question the truth of the Holocaust? "Do we question whether the earth is flat? There are certain stories that can't have two sides." Last year, an inquiry was carried out into claims of anti-Semitism in the Labour Party following the suspension of MP Naz Shah and ex-London mayor Ken Livingstone. It found there was evidence of "ignorant attitudes" but that the "Labour Party is not overrun by anti-Semitism, Islamophobia, or other forms of racism". Labour leader Jeremy Corbyn was then criticised when its author, Shami Chakrabarti, was nominated to become a Labour peer. Mr Livingstone, who denies accusations of anti-Semitism, is currently suspended from Labour over comments he made about Adolf Hitler and Zionism. A party spokesman said: "Labour condemns anti-Semitism in the strongest possible terms and our NEC unanimously passed tough new rule changes last week. "All groupings in the party should treat one another with respect. We will not tolerate anti-Semitism or Holocaust denial."